Peregrine provided, manufactured and tested an enabling design which was a Radiative Coupler. 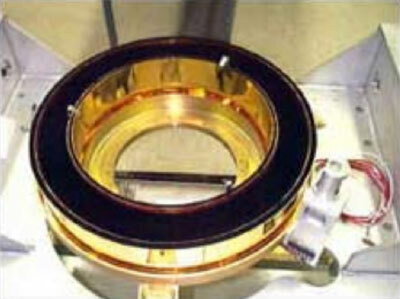 The purpose of this device was to transport thermal energy from a sensor “on” gimbal to an “off” gimbal radiator. Typically, problems exist with the dissipation of thermal energy from a sensor that is located on a gimbaled system. 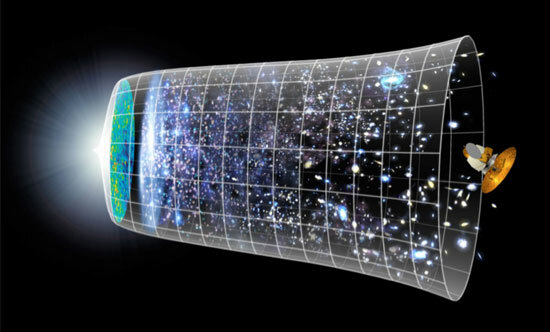 In space where vacuum exists, thermal energy must be either conductively or radiatively transferred “off” the gimbal. In this particular case, the thermal energy was to be transferred from the instrument onboard a gimbal by radiative means. This was done by a series of four cascading rings, with multiple fins nested against each other (but not touching) in order to provide surface area to radiate heat across the physical separation. The rings were allowed to rotate but not come into contact. This allowed for the nested fins to transfer thermal energy from “on” gimbal to “off” gimbal. As can be seen in the photographs, low emissivity gold was used to eliminate parasitic heat losses from the radiative coupler. A high emittance thermal coating (black) was used to radiate heat from one fin to another. 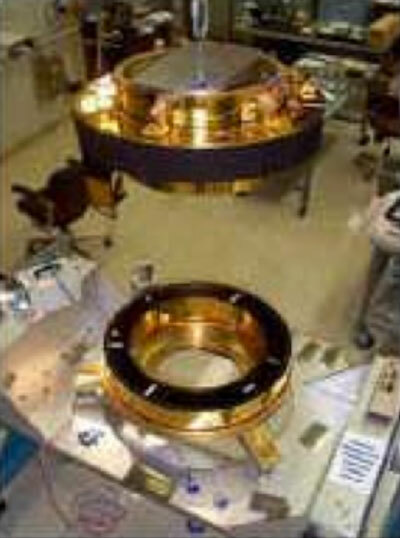 Various mounting locations and physical attachments were necessary in order to transfer the thermal energy from the instrument on the gimbal into one side of the radiative coupling device and vice versa, transferring the heat load off the mating radiative coupler and onto a radiator. The overall size of the radiative coupler was approximately 28 inches in diameter with an overall height of approximately 4.5 inches. The unit was constructed by forming, stress relieving, metallurgical joining, cleaning, plating, deposition and mechanical assembly. This radiative coupler effectively provided conductive heat transfer to dissipate the heat from the coupler on one side and to the other side. 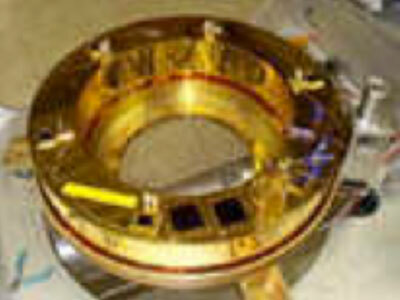 Peregrine was able to meet all requirements and successfully deliver the radiative coupler. This product was an enabling design that provided an innovative solution to the thermal transfer of waste heat “on” gimbal to “off” gimbal.